Our small Sylvania Outfitters storefront carries a selection of items for your canoe camping trip into the Sylvania Wilderness, providing the necessary supplies for your canoe camping and fishing expeditions. Equipment rentals include Kevlar, aluminum and Royalex lake and river canoes, carbon fiber paddles, Kestrel, tandem and sea kayaks, rowboats, trailers, tents, gas stoves, folding tables and chairs, and just about any other supplies, accessories or gear that you may need on your adventures through the Sylvania Wilderness. Our skilled and knowledgeable staff is happy to help customize your outfitting to ensure that you have everything you need for the adventure of a lifetime. We also carry in-house designed Sylvania Wilderness apparel, a lovely book on the Sylvainia area, many souvenir patches and stickers, fishing licenses, lures, and maps, as well as freeze-dried backpacking foods. 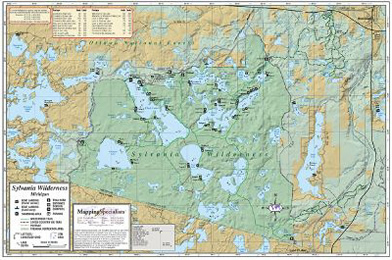 In addition, Sylvania Outfitters Inc. is the only outfitter permitted by the US Forest Service to provide canoe trips into the Sylvania Wilderness and the surrounding Ottawa National Forest. Whether you're planning a simple day trip or an extended excursion, we'll provide almost everything you need and deliver it to your drop point. Below is a small list of some of the items and products available in our store. For a list of rental equipment and prices, please check out the Equipment Rentals page for more information. 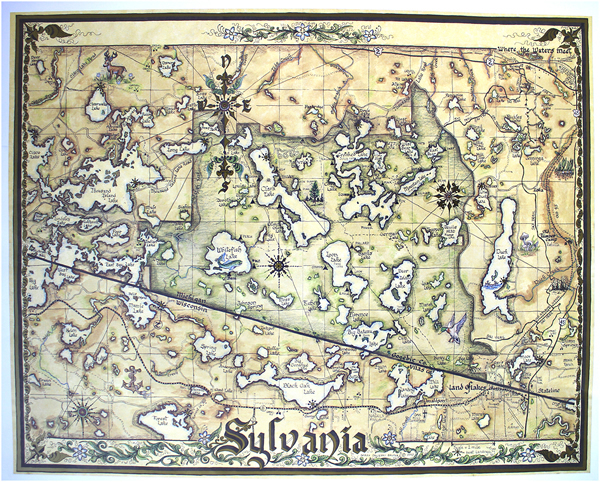 We also have a large selection of maps available that cover the Sylvania Wilderness and Recreations Area. For more information about the maps we have available and purchasing them, please visit our maps page. Bonnie Peacock's classic book about the history or the Sylvania Tract. This map is truly a work of art! Hand drawn, with wonderful calligraphy, and a look of antiquity. One of a kind you'll never find; a map in every aspect of the word. Correct down to the smallest detail.. These patches let people know you've spent time in the Sylvania Wilderness, and make a great souvenir. Most popular is our new 17.5 x 11.5 inch waterproof map, which is a must have for your excursion through the Sylvania Wilderness.